Hatha is the umbrella term used for many yoga practices in western culture and includes popular classes such as vinyasa, power and restorative yoga. This inclusive style of yoga highlights the use of physical postures and breathwork as a means of calming the body, mind, and soul. ‘Ha’ means sun and ‘Tha’ means moon – Symbolic of the union between the solar and lunar, or masculine and feminine, energies within each of us. With the regular practice of Hatha yoga, practitioners take tremendous strides towards inner happiness, balance, and clarity. 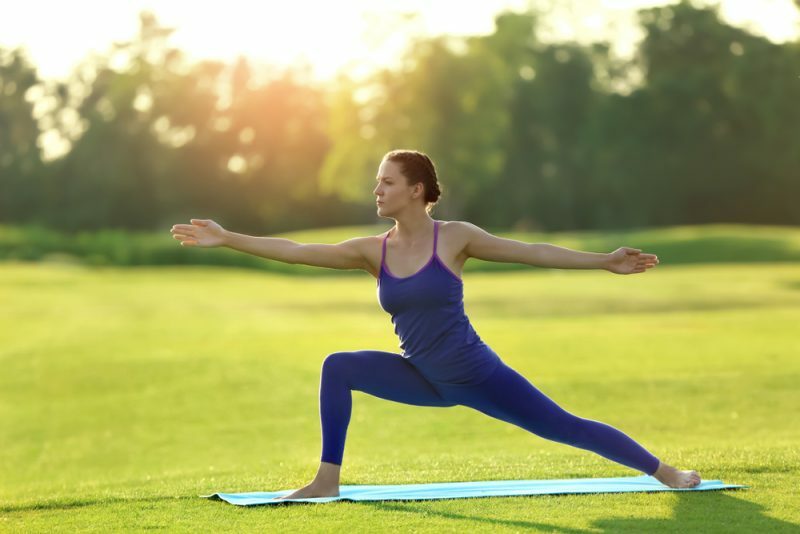 Whether you’re new to yoga or a seasoned practitioner, these fundamental postures create the framework for various styles. Focus on slow, mindful movements with proper alignment to support your body. Controlled breathing plays a key role in the practice of Hatha yoga – Inhale to expand or lengthen, and exhale to surrender or deepen. So wherever you are on your yoga journey, Hatha is either a great place to start or an excellent way to revisit some basic postures. Stand tall with your big toes together and your heels slightly apart. Raise the toes from the floor, spread them wide, and set them back down. Ground down through all four corners of the feet. Activate the legs by drawing the kneecaps up the thighs. Broaden the sit bones by internally rotating the thighs. Move the belly in and bring attention to the natural curve of the spine. Place the shoulders directly over the pelvis and expand across the chest. Let the shoulder blades descend down the back. Hang the arms by your sides with palms facing forward. Keep the neck long, the gaze forward, and the crown stretching skyward. Stand at the head of your mat and slowly begin to shift weight into your right foot. Lift your left foot off the ground and place the foot on your right ankle, calf, or inner thigh. Let the left knee open back to release tension in the hips. Keep your right leg straight without locking the knee. Press your hands together at heart center or lift them overhead as you breathe for thirty seconds. From a standing position, hinge forward at the hips and let the arms go heavy towards the floor. Lengthen the front torso away from the groins as you move deeper into the fold. Place fingertips or palms on the floor in line with the toes. Keep a gentle bend in the knees. Engage the legs to loosen the lower back. Move your weight towards the toes to arrange the hips over the ankles. Allow the head and neck to hang heavily towards the floor. Take ten full breaths here. From a tabletop position, tuck your toes and press down through the hands to send your hips up and back. Straighten the legs and spread the fingers wide. Roll the forearms in and the biceps out. Let your head and neck unwind as you draw the shoulder blades down the back. Engage your legs to take weight out of the arms. Surrender your heels down, tip your tailbone towards the ceiling, and internally rotate your thighs. Lie on your belly with arms by your sides and palms facing down. Rest your third eye center on the mat and plant the tops of the feet down. Roll your shoulders away from your ears to open across the chest. Inhale to raise your upper body off the floor, stretching your arms towards the wall behind you. Lift your knee caps from the floor by engaging the legs. Lie on your back with knees bent, feet flat on the floor, and arms down by your sides. Reach your fingertips towards your heels and plant your palms down firmly. On an inhale, press through the hands and feet to lift the hips and torso off the mat. Keep your arms as they are or interlace your hands and press the forearms down. Hold for five to ten breaths before lowering down one vertebra at a time. Stand at the front of your mat and take a wide step back with your left foot. Turn your left foot out and right toes straight ahead, lining the front heel up with the back arch. Inhale your arms out in a T-shape and gaze beyond your right fingertips. Exhale to bend deeply into the right knee, stacking it directly over the ankle. Keep your spine straight up from the pelvis as you take five breaths here. Begin in Warrior II with your right foot forward. Shift your torso towards the front of the room and then sweep your right arm towards the ceiling. Lengthen your left arm down the back leg. Keep bending into the front leg as you breathe space in the right side body. Bring your gaze up to meet the right hand. Hold for five breaths on each side. Find a comfortable seat with knees together and ankles framing the sit bones. Use a block under the sit bones as needed. With both sets of toes pointing straight back, press the tops of the feet down. Rest your hands on your lap and relax the shoulders. Stay here for one minute. Lie flat on your belly with feet at hip-distance and both arms flat by your sides. Bend the knees, flex the feet, and stretch your hands back to take the outer edges of the feet or ankles. Inhale to gently raise your chest off the ground by pushing the feet into the hands. Take five deep breaths before releasing down to the floor. Stretches thighs, knees, and hip flexors. Find a seat with soles of the feet together and knees wide. Draw your heels in as close to the sit bones as is comfortable. Using your hands, press the outer edges of the feet together. Sit tall and move the shoulders away from the ears. Sit with both legs extended straight ahead. Ground down through the sit bones by removing and extra flesh. Flex your feet and engage the thighs, drawing the kneecaps up. Relax the shoulders as you stack them directly over the hips. Place the palms on both sides of your hips. Inhale to maintain length in the spine. Start lying on your belly with palms planted under the shoulders. Root the tops of the feet down. Direct your elbows straight back and hug the arm bones in towards your body. Anchor your pubic bone down to the floor. As you inhale, roll your shoulders back and lift the chest from the floor. Keep your neck neutral and low ribs on the floor. Hold for one full breath before exhaling back to the floor. Spread your knees just wider than hip-width while pressing the big toes together. Lengthen your arms forward as you melt your forehead into the mat. Let the belly release between the thighs. Continue to rest here and connect to the breath for as long as you need. Stand at the head of your mat and step the right foot back into a wide stance with the foot turned slightly out. Lift your arms straight out in a T-shape. Point your left toes towards the front of the mat. Exhale and reach your left fingertips straight over the front leg. Place your left hand on your shin, ankle, or a block inside your front foot. Extend your right arm towards the ceiling.